The decision to geld a promising youngster is never taken lightly but trainer Peter Snowden is convinced it was the right move with Invincible Lad. He had a tendency to race too hard and, despite being stakes placed as a colt, wasn't going to realise his potential. So with that now rectified Snowden is expecting the new and improved Invincible Lad to be a force when he returns in the Spring On Sale Plate (1100m) at Canterbury on Wednesday. "He has ability but he was just doing things back to front last time in,'' he said. "We thought he was a Diamond horse but he didn't measure up, he was going too hard in front and stopping late. A lot of work has gone into teaching Invincible Lad, who was $3.60 with TAB on Tuesday, to settle in his races and that has been on show in his two recent trials. While beaten 4.8 lengths in his most recent, over 1045m on a heavy track, Snowden said it was proof the hard work is paying off. "He was okay the first time and much better the second time even though there was a tearaway leader,'' Snowden said. "He made good ground late and I thought he handled the ground. Snowden admits he's been very disappointed with the preparation of stablemate Cosimo ($26) and can only go into the race hopeful. Interestingly, Cosimo seems to suffer the same issue Invincible Lad has now been cured of. "I thought a bit of this horse but he went way too hard the other day at Newcastle. He's running out of chances,'' he said. The Canterbury track condition will determine whether Jen Rules makes her debut in the Tab.com.au Plate (1100m). The Redoute's Choice filly, early TAB favourite at $3.60, was an impressive trial winner at Randwick on June 12 but Snowden isn't sold on her on a very heavy surface. Meanwhile, Snowden said Everest champion Redzel has been back in the stable for a week as he builds towards his defence of Australia's richest race. Reigning Everest winner Redzel is back in work at Randwick. (Pic: Steve Hart). The rising six-year-old had a month off after running fourth in the Doomben 10,000 and Snowden said he's looking in great condition. 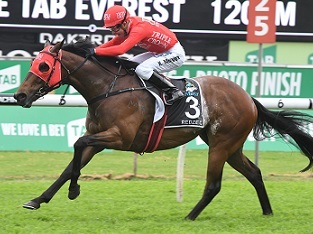 It's likely there'll be a change in program for Redzel in the lead up to The Everest with The Shorts (1100m), the race he won last year to clinch an Everest berth, his first-up run on September 15 then the Premiere Stakes (1200m) two weeks later. The $13 million The Everest is run on October 13. "Two weeks apart off a long break will be fine for him,'' Snowden said. Another potential spring star in grey filly Pure Elation is also back in her box at Randwick with Snowden eyeing the Group 1 Coolmore Classic (1200m). Pure Elation was a revelation in the autumn with a close second to Estijaab and an impressive last start win in the Group 2 Percy Sykes Stakes to her name. "She really put her hand up and had a good crack and showed she's a mentally tough filly,'' he said. Check out the fields, form and replays for Canterbury Park on Wednesday.